In this episode Shahriar repairs an Agilent 54845A oscilloscope with an intermittent failure. The instrument occasionally fails self-calibration and the displayed waveform shows undesired spurious activities. The teardown of the instrument reveals customized front-end section coupled into a ceramic-substrate ADC ASIC designed by Agilent. The packaged ADCs are placed in sockets. The ICs are removed and the ceramic carrier is cleaned; this resolves the intermittent problem with the channels. The architecture of the scope is also presented. 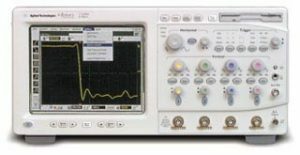 The functionality of the scope is verified through self-calibration, self-test and measurement of various waveform. Hi there – I just got a 54845A and I’m seeing issues with vertical calibration on channels 1 & 3 – It seems strange that its 1 and 3 given that the channels, from you video, see to be bonded as 1 & 2, 3 & 4 (also from the acquisition dialog for getting 8 GSa/s. I’d like to try cleaning the A/D – Can you share how you cleaned the pins/hybrids? Just in case someone else comes looking – I ended up removing the hybrids and just cleaning them with IPA. I used a Caig Labs “Precision Foam Swab” (SWP-25 was my part number) to rub on the hybrids and across the tops of the pogo pins. It seems to have done the job – My unit now passes calibration on all channels and the FISO test in the self test dialog.